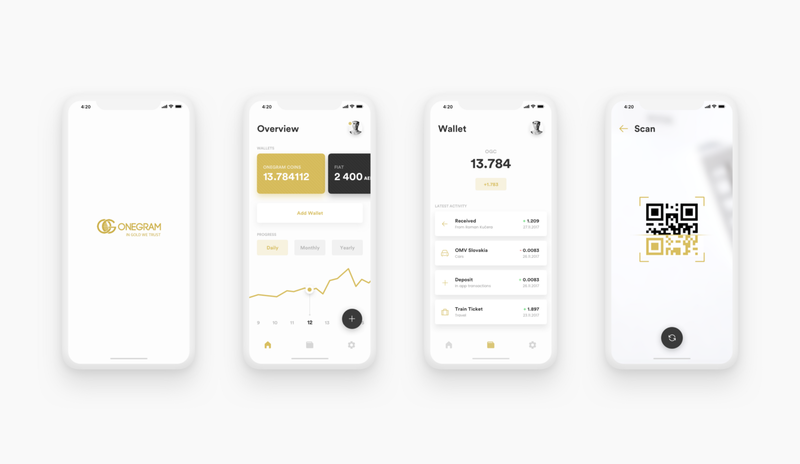 For e-wallet applications, it is important to keep the UX in mind so the user has all the necessary information that is readily available, legible and comprehensible. When designing OneGram e-wallet, we followed this rule. 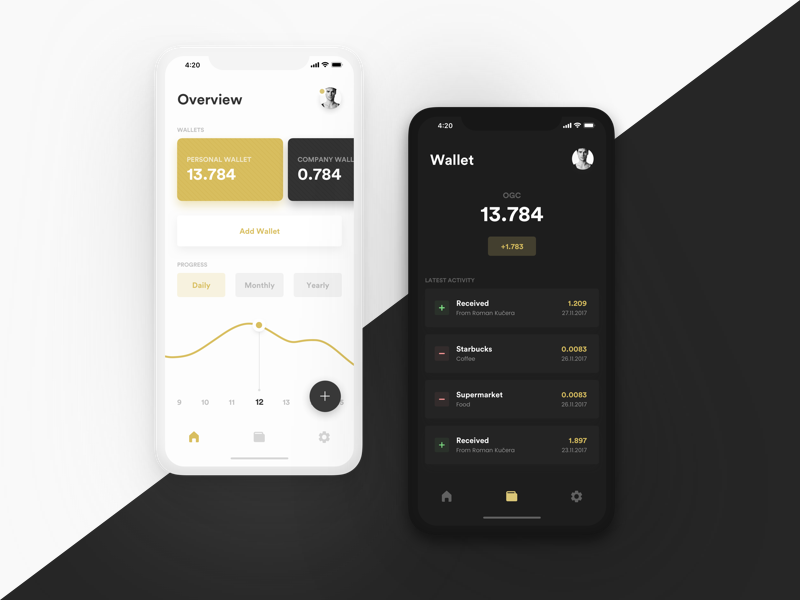 Once you get to the first screen of the app, you can see all the necessary information like: Your wallet (OGC & Fiat) with a value, a button to add another wallet, progress chart showing progress between days, months or years and of course the floating button for Add OGC to your wallet. For navigation, we have left out the hamburger menu and moved the entire navigation to the bottom tabs. They are always easy to access and the lower part of the screen is the best touch environment for the user. Information about the user’s profile is available under the user’s photo. It is also important for users comfort to add a feature that will be able to “customize” your application environment and as the white-backed application is added to the “Dark mode” option, it means that the user’s entire User Interface changes from white to dark. A great feature especially at night checking your finances where white color does not tire and does not irritate eyes while saving the battery life. One of the most important features in the app is, of course, adding media. This is how we added, as mentioned above, to the floating button that accompanies the user during the main screens. This gives the user the advantage of not being able to add resources from just one screen but can do so from multiple screens. Another important thing is to see your last activity, respectively. to see the last transactions my wallet has made. After clicking into one of the purses at the top of the screen, you can see the few recent transactions that have been made. 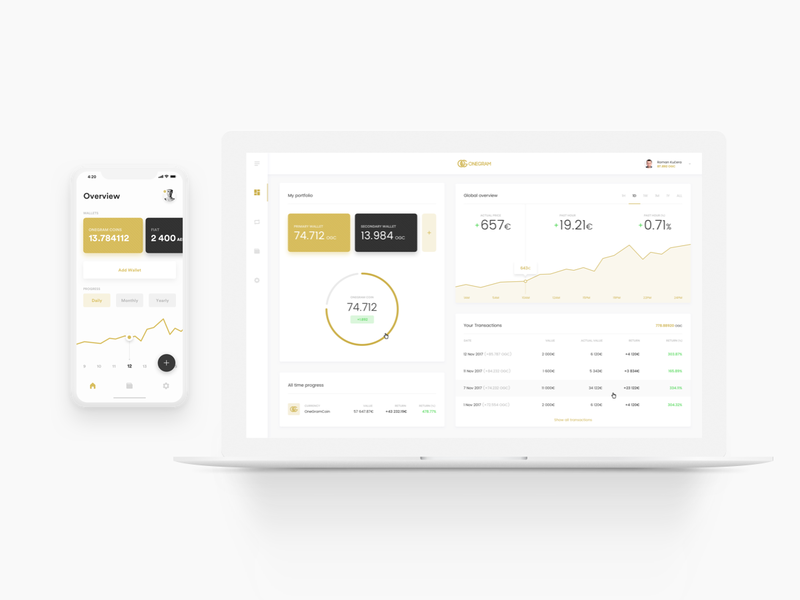 In addition to scrolling to the bottom of the screen, you’ll see the “Show all transactions” button, which will display a new screen to the user with a full history of transactions where they can be filtered, arranged, erased, etc. All platforms must be perceived in the same way and must not contain any changes that are unclear to the user. The Select team of professionals and blockchain enthusiasts, experienced in blockchain business strategies, crypto development, security or smart contract. Team of professionals and blockchain enthusiasts, experienced in blockchain business strategies, crypto development, security or smart contract.